We use the Heat Exchanger everyday in our homes, workplaces and transportation vehicles without even knowing it. The heat exchanger is a thermal heat transfer device that exchanges (hence their name) the thermal energy from one source and transfers it to another at different temperatures. In most heat exchanger designs, the fluids or gases used to transfer the heat are separated and do not mix. Heat exchangers are used in conventional thermal heating systems, air-conditioning systems, refrigeration equipment, transportation and in renewable energy heat recovery systems such as Solar Thermal Panels, Geothermal and other such types of solar thermal energy systems. But the more common types of heat exchangers that we see and use daily include home central heating radiators, automobile radiators, HVAC condensers and evaporators, fire stove back boxes, and oil coolers, etc. The use of heat exchangers in our daily lives, big or small, is endless. If you have ever used a hot water bottle in the bed at night to warm your feet then you know only too well the advantages that heat exchangers can bring. So how does a heat exchanger work?. 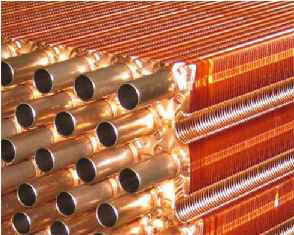 The Heat Exchanger is a passive corrugated mass of metal which transfers the heat from one working fluid to another. The primary thermal fluid absorbs heat from a heat source, either a burner, boiler or other form of heating device, and then circulates through the heat exchanger where the heat is removed from the fluid (either water or gas) and is transferred to a secondary fluid, again either water or a gas that circulates and dissipates the heat (heat sink) into the home or atmosphere. Solar water heating systems use heat exchanger technology to transfer the heat from the sun into the circulating water with many indirect systems using a heat exchanger that is separate from the solar collectors. These types of heat exchanger are what are known commonly as water-to-water heat exchangers as the both the primary and secondary fluids is water, possibly mixed with an anti-corrosive addictive. Air cooled heat exchangers are another type of exchanger design found in automotive applications to cool the engine. The primary fluid is water but the secondary fluid is air blown through the fins of the heat exchanger with fans. Normally, there are no moving parts in the heat exchanger only exterior fans to circulate the air. There are many heat exchanger designs available to choose from including: tubular, double-pipe, flat plate, spiral and coil designs. The selection of one type of exchanger design depends on many factors. Most heat exchangers are classified according to their construction, heat transfer process and their surface compactness. That is the amount of surface area for the heat to dissipate from or transfer too compared to the physical size. Tubular heat exchanger are by far the simplest design. The primary fluid circulates through straight or concentric pipes in the form of U-shaped tube design. These primary tubes are encased within an outer sealed tube that circulates the secondary fluid. Their usual application is in small heat water-to-water transfer applications. The advantage of this type of design is flexibility since tubular heat exchangers can be added or removed as required. Also any number of heat exchangers can be connected together in series or parallel combinations. While being very simple and basic, the effectiveness of this type of single pass heat exchanger design can be increased by having the directional flow of the secondary fluid in the opposite direction to the primary flow to improve heat absorption and efficiency. If both the primary and secondary fluids flow in the same direction, then this is called “parallel-flow”. If the primary and secondary fluids flow in the opposite direction, then this is called “counter-flow”. Also the inner heat pipe can be either a single bare tube, fitted with fins to increase the surface area, or as a multi-tube design as shown. Flat plate heat exchangers are another common type of design which offer improved efficiencies for their size compared to tubular designs. Flat plate heat exchangers provide a relatively large heat transfer surface in a small space and can also operate at higher fluid pressures. Flat plate heat exchangers are made from lots of thin metal plates joined or “stacked” together, with a small amount of space between each plate to allow the heat transfer fluid to circulate, extracting heat from the plates as it flows. These individual plates are usually joined together using rubber gaskets and seals to prevent leakage and direct the thermal fluids through alternate flow passages. 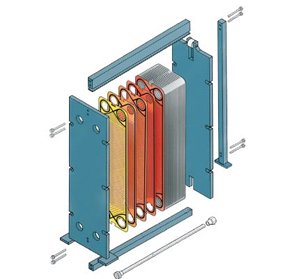 Other types of flat plate heat exchangers include brazed or welded exchanger designs. Because the surface area of flat plate exchangers is large, this allows for maximum contact between the two heat transfer fluids which provides for effective and efficient heat transfer. Just like the tubular design, the liquid flow of the two heat transfer fluids can be either parallel flow or counter flow direction with each plate having four apertures serving as inlet and outlet ports. Plate-fin and tubular-fin heat exchangers are another more common type of thermal heat exchanger categorised as “compact heat exchangers”. They consist of plain, corrugated or louvred designed metallic fins that are bonded, brazed or welded onto a series of flat, round or rectangular tubes. This type of heat exchanger design as been used for many years either with individual fins or plate-fins in a wide variety of applications. Compact heat exchangers get their name from the fact that their construction results in a very large thermal surface area within a small physical size. The compactness of the exchanger is usually given in so many m2/m3 of physical size, with surface area densities of over 1000m2/m3 now common. 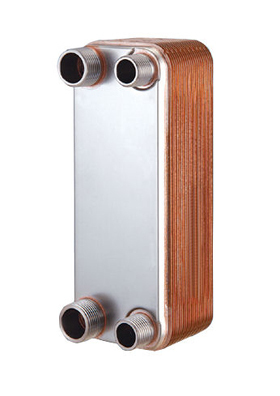 Compact heat exchangers are commonly used as automotive water and oil cooling radiators, air conditioning applications, process and waste heat recovery, ocean thermal energy conversion, geothermal and solar thermal systems. In fact anywhere where there is a need for a small compact light-weight, space-saving, and economical heat exchanger. We have seen that the Heat Exchanger is a mechanical device that is used to transfer thermal energy between two or more circulating fluids at different temperatures. These fluids are usually separated by some form of heat transfer surface, whether of a tubular, flat plate or finned design. Heat exchangers are usually classified according to their construction, compactness and the way they transfer the heat from the primary to the secondary fluids. Heat exchangers are commonly used in transportation, HVAC, process, power, heat recovery, renewable energy and other such applications. The types of heat exchangers commonly used in our daily lives include automobile radiators and coolers, air conditioning and geothermal evaporators and condensers. Heat exchanger technology and design has come a long way over the years and there has been a steady progress to reduce the size and compactness of radiators, chillers, evaporators and condensers to improve conversion efficiencies. Compact heat exchangers are now becoming more standard and which have a large heat transfer surface area density per unit volume greater than 800m2/m3. In compact exchanger designs the two fluids usually move perpendicular to each other with the primary fluid being a liquid and the secondary fluid being forced air. Of course the thermal performance of any heat exchanger will deteriorate over time as a result of accumulation of dirt and deposits upon heat transfer surfaces as the layer of deposits represents additional resistance to the transfer of heat.